When kids (or adults) start to learn proper electronics one of the tricky bits is learning to read the values on resistors. Resistors are color-coded with bands and you need to learn to read this key. Well Adafruit have just come up with a fun way to do that. 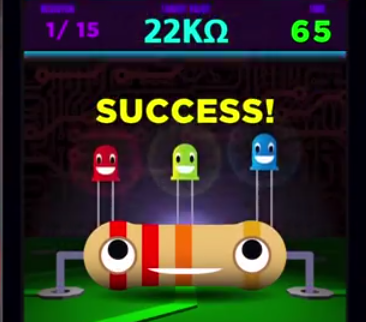 Mho's Resistance is an app for the iPad or iPhone that helps you learn to decode and encode resistor color bands through a fun game which will appeal to kids. For beginners there's a helpful tutorial which explains what a resistor is. You then learn about the colors and positions and what they mean and get to practice before you start to play the game which has various modes. The app costs $0.99 but you also get a code that gives you $0.99 off an order from the Adafruit store where you can buy all sorts of useful electronics goodies or get a plush Mho.